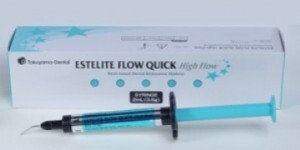 ESTELITE FLOW QUICK High Flow is a low viscosity, high flow, light-cured, radiopaque composite resin. Filler particles are 0.4-0.07μ silicon dioxide and zirconium dioxide. This flowable composite utilizes RAP (Radical Amplified Photopolymerization) technology that allows a long working time of 90 seconds and a quick curing time of 10 seconds. It is indicated for direct anterior and posterior restorations (particularly for small/shallow/tunnel shaped cavities), as a cavity lining, for blocking out cavity undercuts before fabrication of indirect restorations, and for the repair of porcelain and composite. It is available in 3.6 g syringes in shades A1, A2, A3 and OPA2. ESTELITE FLOW QUICK High Flow is provided in a newly designed syringe with an internal gasket to prevent oozing of the material after use. The tips included with the material also have a narrower lumen to help control the flow of this low viscosity composite. Each syringe comes with dispensing tips, manufacturer’s instructions, and product information. All four shades of ESTELITE FLOW QUICK High Flow were evaluated by 17 Editors in over 400 uses. It received a 91% rating. Instructions were rated very good to excellent by most Editors. Editors liked the packaging and the quantity of material in the syringe. A greater number of tips would be appreciated. Editors were highly complimentary of the syringe – they found it to be ergonomic and easy to dispense the contents. The new syringe design has a wide round barrel with a circumferential finger grip that is easy to use in any orientation. The common problem of material oozing from the syringe was eliminated, and the narrow tips were appropriate for the viscosity of the material. The composite is easy to place and adapts well to the tooth. Editors reported the composite had high flow. This was desirable, especially for filling narrow fissures in posterior teeth. Shade match before and after curing rated very good. The composite blended well with the tooth. The opaque shade (OPA2) worked well for masking slight internal stain or restoring a highly opaque tooth. The composite was easy to finish and polish with standard fine diamonds and rotary polishing tips. The composite had very good to excellent final esthetics. 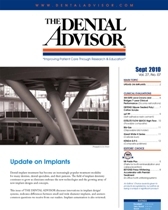 Forty-one percent of Editors reported that ESTELITE FLOW QUICK High Flow was better than other flowable composites and 47% reported it was equivalent. Seventy-one percent would switch to ESTELITE FLOW QUICK High Flow and 88% would recommend it. Tokuyama Dental America has released their flowable composite, ESTELITE FLOW QUICK High Flow in a new PLT (Pre-Loaded Tip) delivery system. ESTELITE FLOW QUICK High Flow is a low-viscosity, high-flow, light-cured, radiopaque resin composite. This flowable composite utilizes Tokuyama’s 100% spherical filler technology for ideal handling and esthetic properties. It is indicated for direct anterior and posterior restorations (particularly for small/shallow/tunnel shaped cavities), as a cavity lining, for blocking out cavity undercuts before fabrication of indirect restorations, and for the repair of porcelain and composite. It is available in shades A1, A2, A3 and OPA2. ESTELITE FLOW QUICK High Flow is also available in a newly designed syringe with an internal gasket to prevent oozing of the material after use. The tips included with the material also have a narrower orifice to help control the flow of this low-viscosity composite. There are two available viscosities in the Tokuyama flowable composite line, ESTELITE FLOW QUICK and ESTELITE FLOW QUICK High Flow. All four shades of ESTELITE FLOW QUICK High Flow were evaluated by 17 Editors in over 400 uses. It received a 91% clinical rating. Where less flow is needed, the original ESTELITE FLOW QUICK is a better choice.